It almost seems silly to write a post about how to use baskets. But if you follow my Instastories where I take you shopping along with me, you know that an outing is not complete unless I have found a basket to drool over. Seriously, I love them that much. And I inevitably get the messages asking, “What do you use all those baskets for?” or “I love them too, but I have no idea what to put in them!”. Say what? Well dang, girl!! Yes, I will show you how to make sure those baskets are living their best lives. And I’ll list my Top 25 basket picks at the end. If a pretty basket comes home with me, 90% of the time I am putting a plant in it! Big or small, short or tall, you can plop just about any plant in there. I buy one of those cheap plastic saucers from Home Depot to put at the bottom, but if the basket is irregularly shaped I will take Press ‘N Seal plastic wrap to line the bottom of the basket (this way when you place the plant back in the basket after watering, residual moisture won’t ruin the basket). Bonus: adding greenery to any space instantly breathes life into your home! Nothing makes my heart pitter patter like seeing baskets all lined up! The uniformity of it all is enough to make this scrambled egg mom brain of mine try to hold back tears of joy. And when placed under a console in an entry, baskets can be very functional: holding shoes, scarves, extra pillows or throws. Placing baskets at the end of the bed is my new favorite go-to when styling a bedroom. Paired with or without a bench, it creates a cozier space. Not to mention you get to hide all those extra pillow covers and throws from your husband in there. Toys and baskets go together like kids and hair pulling, you really can’t have one without the other. Open or lidded, stuff all the crazy in there! Another utilitarian use of baskets can be found in laundry rooms or open bathroom vanities. But they should also add to the design! Not any old basket will do, if it is going to be on display think of incorporating it into the space as part of the aesthetic. I’d like to refer to the above examples as strategically placed space fillers. They serve to extend and round out the space nicely, looking like an effortless accent piece and can even take the place of a traditional side table. Resting next to a couch or a dresser or propped against a blank wall, these baskets have the perfect excuse to just sit there and look pretty (ah, what a life!). 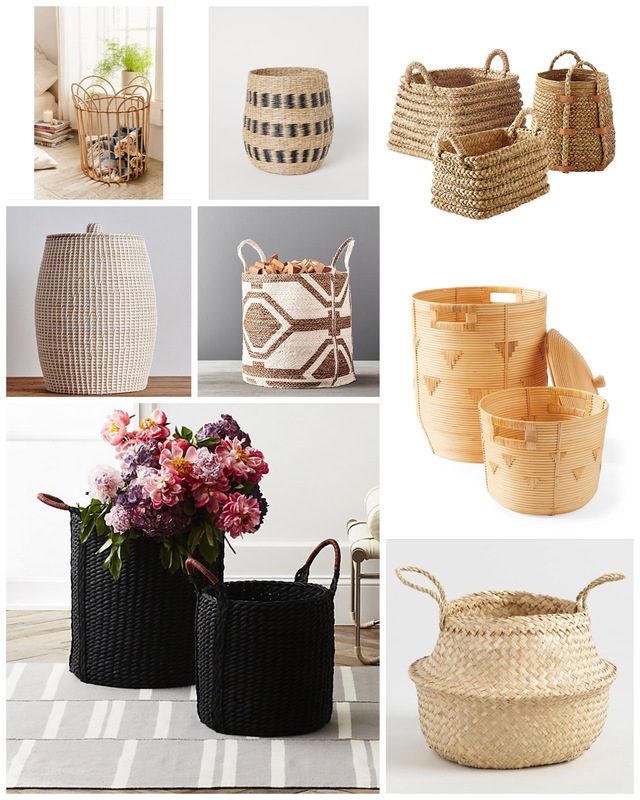 And finally, baskets don’t just have to go on floors! Put them up on your shelves, heck, put the plant in the basket and put it up on the shelf. It can be such a great accent piece to improve your shelfie game. Here is a list of my Top 25 crush-worthy baskets because just one will never do.